I often give demonstrations of the tools, plates and process during my exhibitions, on the opening night where possible. I also have an open studio event once a year as part of my artist studio collaborative so please ask about that if you´d like to visit my studio in West London and see the tools and equipment in person. What is meant by intaglio? This is a print created by hand where no electronic or machine reproduction method is used. There are four main types of traditional printmaking processes: relief, intaglio, surface and screen-printing. The name derives from the Italian meaning ´to engrave´. This describes all forms of engraving on metal. The etching and mezzotint processes are both types of intaglio printmaking where the ink is spread on the engraved plate. Where the image is engraved into the metal, the indentations or grooves created trap the ink. The plate surface is then wiped clean of residue ink, leaving just the ink held in the engraving. Dampened paper is placed on the plate, which when passed through a press, forces the paper into contact with the ink creating a print of the engraved image. How is an Etching created? For line etching the plate is first covered with an acid-resistant wax or resin ground/coating. Then the image is incised (drawn through the wax coating) with an etching needle. The plate is dipped into acid. The acid bites into the exposed lines where the wax was scratched away by the etching needle. 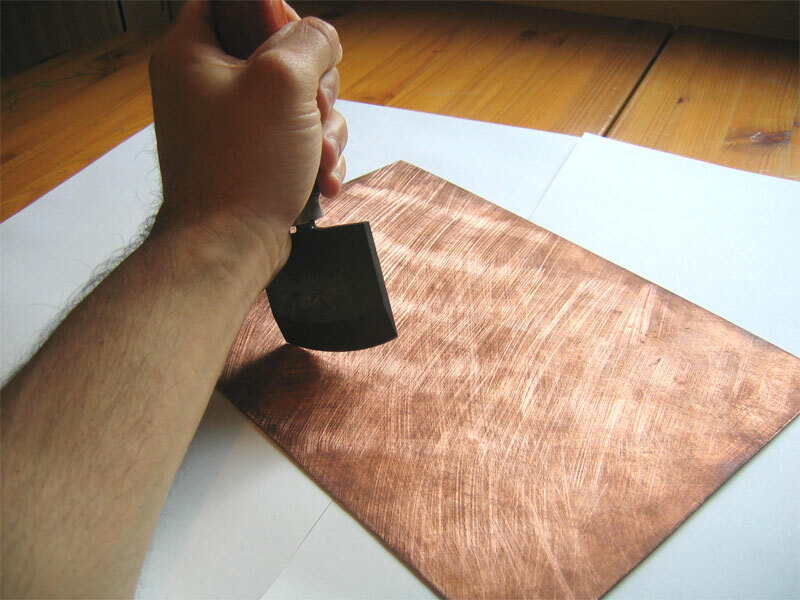 The acid eats down into the copper and the resulting indented line holds ink and this is how the image is created. To add shade onto the plate so that you have shade and line an aquatint coarse ground is added to retain the ink. 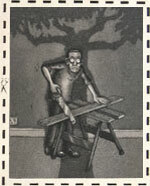 To create an aquatint ground an aquatint booth is used. Inside the booth a wooden paddle whips up aquatint dust, the metal plate is inserted into the base to await the dust that´s about to settle. The dust lands evenly on the metal plate, the heaviest pieces of dust landing first and if you want to create a visible grain you can remove the plate quickly catching only the large grains of dust. For a finer effect, you must put your plate in to receive the finer grains of dust once these start to settle - the skill is in getting this bit right to achieve the coarseness or fineness of grain you want. The plate with the settled dust is removed from the booth and carefully heated from underneath using a small gas heater, this melts the dust and when it cools you end up with microscopic blobs of resin stuck to the plate. When dipped in acid again, the acid eats in between the blobs of resin creating a pitted ground in the copper (shade when inked and printed). The longer the plate is left in the acid the darker shades can be achieved as the acid eats deeper into the metal allowing more ink to be held. To retain lighter shades or to leave an area white a stop-out varnish is used. Using a paint brush a varnish is applied to the area you want to maintain lightness in. The varnish stops the acid from biting into the metal and where the metal has not been bitten the printed image will remain white. Grey is achieved by allowing the plate to sit for a short time in the acid. An etching can be made up of a combination of line etching and aquatint or purely one or other method. How is a Mezzotint created? Mezzotint is an engraving technique on copper. A tool called a rocker is used to make indentations or pits on the copper plate. 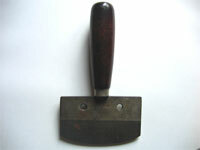 The rocker is a hand held tool with a wooden handle and a curved shaped steel head with comb-like teeth. The teeth push down the soft copper creating the indentations. The plate is ´rocked´ in 26 directions. This means the entire plate is covered in single rows of indentations made by passing the rocker ´by hand´ back and forth over an area 26 times, moving the plate in a circular motion in degrees until the area is completely covered. It is necessary to go over the same area 26 times (this is my preference, other mezzotint artists may do more or less ´passes´) in order to achieve a good black once the image is printed up. By this I mean that where there is a concentration of indentations caused by the teeth of the rocker, the area will hold a lot of ink, therefore creating a good black in the final image. 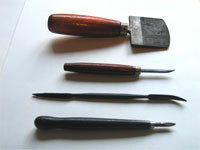 A tool called a burnisher, is used to smooth down the indentations where desired, so that they don´t hold as much ink. 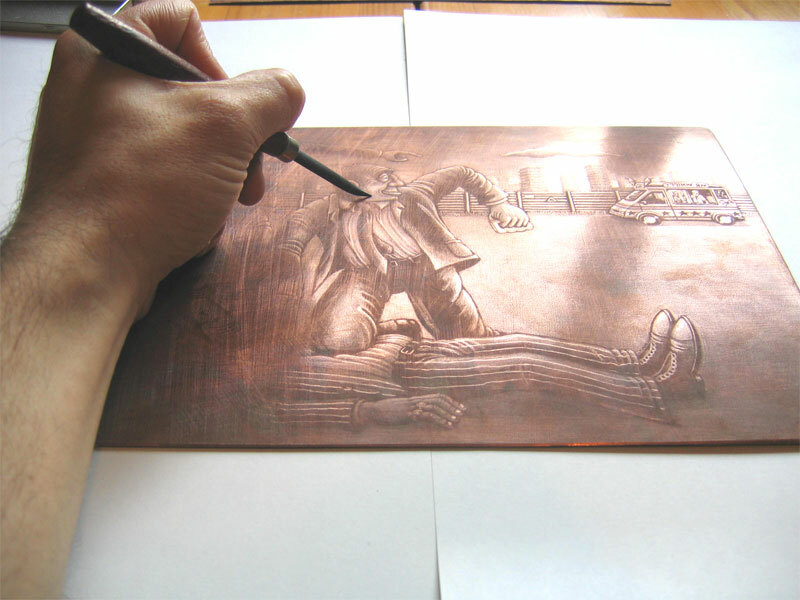 A mezzotint image is created solely in this way. It is completely made up of tonal variations - areas where there are full-sized concentrations of indents in the copper plate and areas where the indentations have been partly reduced using a burnisher. The ´smoothed down´ indentations will hold less ink, creating variations of grey in the final image. This is how the picture is built up. 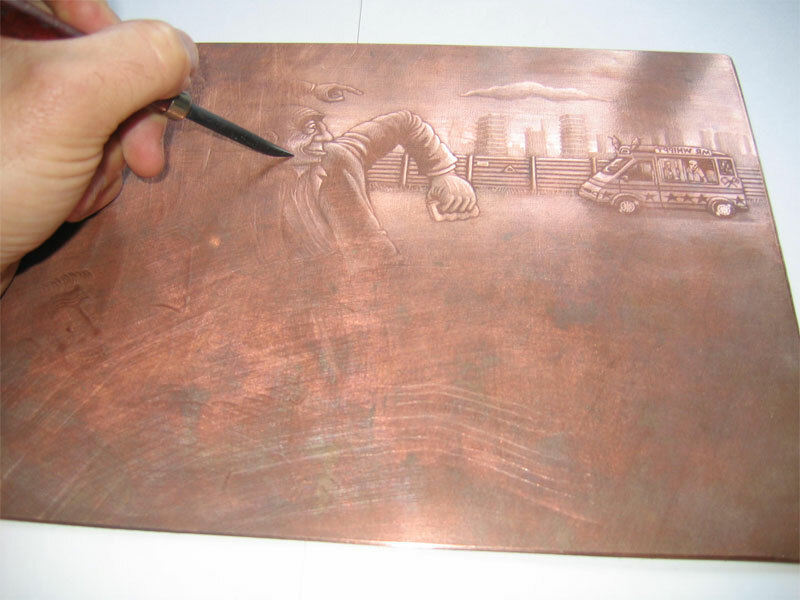 Where I need a part of the image to be white - I will use the burnisher to completely smooth out the area of copper plate desired so the indentations disappear and the result is that particular area will hold no ink at all in the final image, making that area appear white. In Japan, they have created a machine that can ´rock´ the plates for you, but I don´t have access to such a luxury!